St. Cyprian’s is a beautiful chapel built in 1900 that sits just off the busy beaten path of downtown St. Augustine. It is perfect for couples looking for a modest but elegant, intimate church wedding in North Florida. 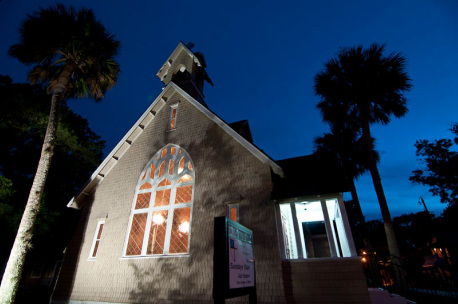 Located in historic Lincolnville, the church is nestled into a neighborhood that's as vibrant as the church's history itself. Graceful architectural features combine with rich, sacred wooded details, to create a warm and inviting atmosphere for couples and guests alike. The sanctuary seats approximately 100 people and modern amenities include: heat and air conditioning, adjustable lighting, an organ, plus audio speakers. Church facilities include: off-street guest parking, an on-site wedding coordinator, indoor and outdoor reception venues, along with ramps for handicap accessibility -- to ensure all guests have access to your special day. Once you've had a chance to browse our photo gallery online, we invite you to take a tour of our chapel in person at any time. To schedule an appointment, contact our Facility Coordinator at (904) 829-8828.